Salvatore Leone telling Claude that he would be doing him a personal favour by destroying a freighter docked in Portland Harbor being used by the Colombian Cartel to manufacture SPANK. For other missions in the Grand Theft Auto series called "Bomb Da Base", see Bomb Da Base. Bomb Da Base Act I is a mission in Grand Theft Auto III given to protagonist Claude by Leone Family Don Salvatore Leone from his mansion in Saint Mark's, Portland, Liberty City. Salvatore Leone informs Claude that the Colombian Cartel have an almost infinite amount of funds from selling SPANK throughout the city, and that he wants Claude to destroy the freighter docked in Portland Harbor being used by the Cartel to manufacture SPANK, Salvatore tells Claude to see explosives expert 8-Ball at his shop to get the explosives necessary. Claude then drives to meet 8-Ball. 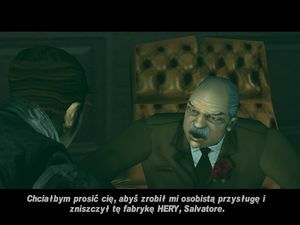 Salvatore Leone (Unsubtitled, PC version only): We should take these Columbian bastards out but while we're at war with the triads, we ain't strong enough. Salvatore Leone: The Cartel has got bottomless funds from pushing that SPANK crap. If we make an open attack on them, they'll wipe the floor with us. They must be making SPANK on that big boat that Curly lead you to. So we gotta use our heads, or rather one head. Your head. I'm asking you to destroy that SPANK factory as a personal favor to me, Salvatore Leone. If you do this for me, you will be a made man, anything you want. Go and see 8-Ball, you'll need his expertise to blow-up that boat. There is no monetary reward for completing the mission. Completing the mission leads the player into the Bomb Da Base Act II mission. This page was last modified on 9 December 2013, at 05:17.